The protracted recession in the euro area will continue to be a drag on the economic growth of most CESEE countries in 2013. By and large, those countries are small open economies held hostage to the excessive fiscal austerity pursued in the euro area and the sluggish progress on the part of its policy-makers in adequately addressing the structural roots of the crisis. At the same time, the private sector demand in the CESEE countries is unlikely to recover substantially in the near term either. Wherever there will be an increase in investments, it will be primarily funded via public money, with EU transfers playing an increasingly important role. In general, the prospects for 2013 are only marginally better than the previous year; any significant improvement will be unlikely before 2014 – in line with the projected recovery in the euro area. These are the main results of the newly released medium-term growth forecast for the region by the Vienna Institute for International Economic Studies (wiiw). Weak exports and suppressed domestic demand pushed nearly half of the Central, East and Southeast European (CESEE) economies into recession in 2012, including the Czech Republic, Hungary, Slovenia and nearly all Western Balkan countries. Elsewhere in the region, growth remained positive but was generally unspectacular, with the notable exceptions of Kazakhstan and Latvia. Also in countries that hitherto had been relatively immune to the euro area crisis (such as Russia, Poland, Ukraine and Turkey), growth dynamics progressively decelerated in the second half of the year. On the whole, 2012 was a disappointing year for the CESEE economies, confirming fears of a double-dip recession in the euro area adversely impacting large parts of the CESEE region. This rather poor performance stands in sharp contrast to the better dynamics in other ‘emerging markets’ in Asia and Latin America, and underscores the dependence of large parts of the CESEE region on the troubled euro area (not least in terms of policies pursued) and the structural weakness of many CESEE economies. The crucial factor behind the disappointing CESEE growth performance has been the weakness of domestic demand. Import demand generally lagged behind export growth, and net exports contributed positively to GDP growth in 2012 – despite the anaemic external environment. High unemploymentand stagnant wages, coupled with fiscal austerity and the ongoing (albeit in some cases decelerating) household deleveraging, continue to weigh heavily on the dynamics of private consumption in most CESEE countries, with the exception of Russia, Ukraine, Kazakhstan and the Baltic states. In turn, investment activity is suppressed by the lasting, and in some cases even deteriorating, perception of uncertain future prospects and by underutilized capacities in an environment characterized by weak demand – even though large parts of the corporate sector are awash with liquidity. In these circumstances, the investment dynamics in the region has been shaped by public investment projects, frequently supported by EU transfers (first of all in Estonia and Romania). The expected marginal improvement in economic performance in some CESEE countries in 2013 is largely due to the somewhat less restrictive fiscal policy (e.g. the Czech Republic) or a better performance of agriculture (Serbia, Romania). However, in Poland and Slovakia economic growth will decelerate, while Slovenia and Croatia will be unable to avoid another recession this year – notwithstanding the likely beneficial impact of inflows of EU funds in the latter case. The near-term economic prospects are generally better on the ‘fringes’ of the CESEE region: the Baltic states, Russia, Kazakhstan and Turkey, which are less dependent on the troubled euro area and are in no rush (or need) to pursue fiscal consolidation. In Ukraine, economic prospects are dependent on a timely and ‘controlled’ currency devaluation, which would be crucial for the badly needed growth re-balancing. Even under the most optimistic scenario, in the medium and long term the CESEE countries will be generally unable to replicate the growth rates observed prior to the 2008-2009 crisis. In the Western Balkans, the bleak growth prospects and the high levels of unemployment may eventually imperil the fragile social and political stability of these countries. 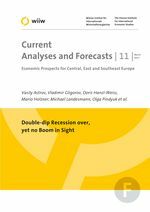 The newly released wiiw Forecast Report also contains ‘special topics’ dealing in-depth with: (1) regional and EU-wide fiscal policy issues, (2) the extent of deleveraging in the household, corporate and banking sectors, and (3) the patterns of structural adjustment and unit labour cost developments in the CESEE countries. Last but not least, it includes for the first time a country report and statistical information on Kosovo. Schuldenabbau in den MOEL: wo ist die Liquidität geblieben?